Organisms in the order Lactobacillales are members of the lactic acid bacteria (a group of bacteria that produce lactic acid as the primary end-product of carbohydrate fermentation). All bacteria in the LAB are also incapable of produceing the enzyme catalase. Figure 2. 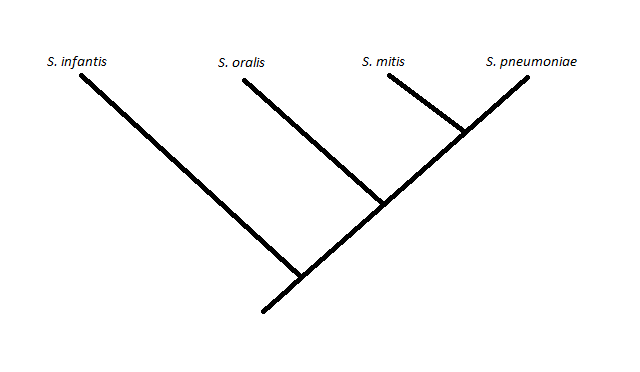 Phylogenetic tree showing Streptococcus pneumoniae in relation to other Streptococcus species. Adapted from Figure 9 of Structure and dynamics of the pan-genome of Streptococcus pneumoniae and closely related species by Donati, et. al. It is important to recognize that S. pneumoniae is just one of many bacteria that fall into the categories stated above. There are a variety of other bacteria that are very similar in behavior and function to S. pneumoniae and are as equally menacing to humans. One of these related bacteria are Streptococcus mutans which are the primary cause of tooth decay in humans. This bacteria, though not as invasive, is still a large concern for humans as they cause millions of oral cavities all over the world. Another bacterium that is similar to S. pneumoniae and even more frightening is Streptococcus pyogenes. This bacterium is a well known flesh eating bacteria that is very dangerous for those unfortunate enough to contract it.